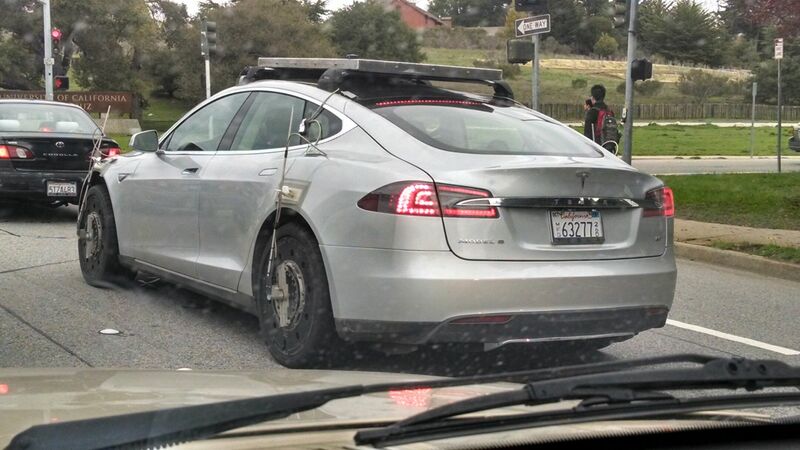 SpyShot: Could Strange Tesla Model S Could Be Self-Driving Or All-Wheel Drive Prototype? Live in or around California’s Silicon Valley, and the chances are you’ll see multiple Tesla Model S Sedans on your daily commutes to and from work. In fact, in some areas, Tesla Model S sightings are so common that saying you saw one isn’t a newsworthy item any more. But for one Californian Model S fan, a sighting of an unusual Model S on the freeway while driving home was newsworthy enough to make the headlines, because the car he spied was laden with enough test equipment to suggest that it was in the process of validating a new technology for the popular plug-in automaker. Luckily for us, Frank Hsueh, the EV fan in question, had a dash-cam fitted which captured the car in question so he could share his sighting with all of us on YouTube. The picture isn’t all that clear due to the weather and time of day, but we can clearly make out a Tesla Model S retrofitted with some externally-visible extra tech that makes us agree that this car is indeed quite special. For a start, each wheel is fitted with an external odometer, something used to record and note the rotation of each wheel, but then on the roof is a flat box of some description, seemingly mounted like a roof rack. Is this Tesla’s first autonomous vehicle prototype, or perhaps a engineering test-bed for the promised all-wheel drive Tesla Model S expected some time later this year? We’re not sure. Having watched the 86 second video a couple of times, we can see the case for either possibility being made. When we first see the car, it is following another vehicle in the left lane, slowing and speeding up in accordance with the traffic patterns. To our untrained eyes, the acceleration looks a little too jerky for it to be a form of autonomous drive, although we do note the distance left by the unusual Tesla between it and the car in front is on the large side for your average Californian commute, and the car seems to respond pretty quickly to the driver in front braking. We also know that external odometers like the ones seen on this car have been used by Google’s own self-driving autonomous car program, and the roof-mounted box could easily be some form of additional autonomous driving sensors or equipment. It’s worth pointing out too that prototype autonomous cars are now legal in California. On the other hand however, we suspect this car is more likely Tesla’s early prototype all-wheel drive Model S or engineering test mule for the upcoming Model X, using the external sensors to monitor performance and handling. But what do you think? Have you seen this unusual Tesla on the roads? Where was it? and how was it being driven? Leave your thoughts, speculations, and stories in the Comments below.